I don't have an answer to this. I just wanted to say that both my laptop and pc also say that there's a trojan horse. 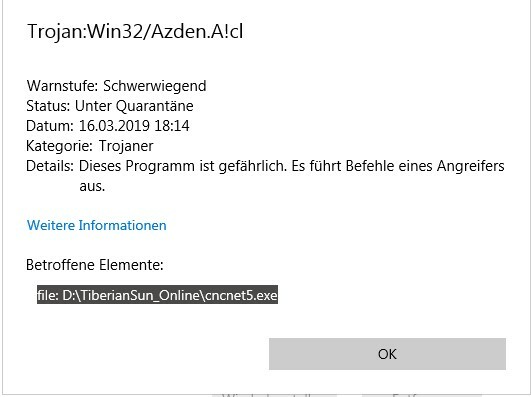 Seems like there are some false positives with a recent update of cncnet5.exe. I've submitted the cncnet5.exe to Microsoft for analysis so far. what can i do so i can still play tiberian sun? 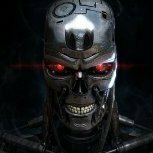 How long until we are able to log on CNC? 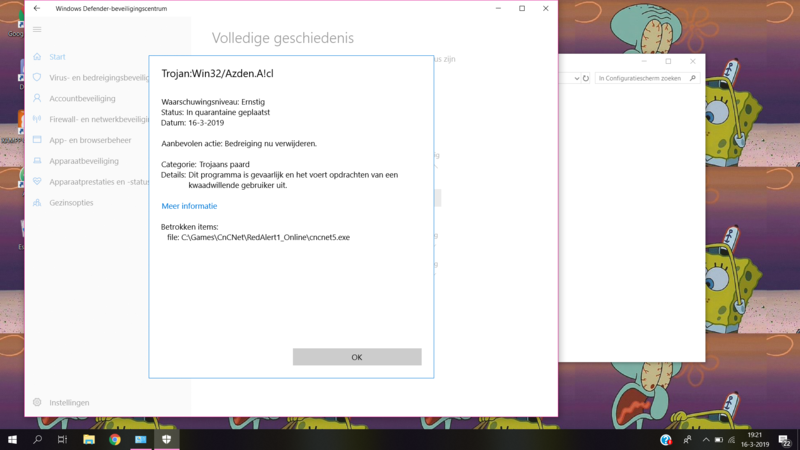 I'm getting the same message and windows wont allow the program to open. To play, you will have to go to Windows Defender Security Center -> Virus & Threat Protection, then click on Threat History. You will see Win32/Azden.A!cl, click on that and Restore. Edit: Microsoft has updated their definitions and cncnet5.exe is no longer getting flagged. All you have to do now is to update your virus definitions in the Security Center. my security is updated and still can't play..
Then do what's crossed out. I need help in regards of slow savegame loading and lately some random crashes. I searched alot the internet for a solution, but couldn't find one. I emphasize, that it effects only Firestorm, at least i didn't faced with the followings, while playing through TS. The game version, what i play, is downloaded from CNCNet, but the current game directory containes the file, which i listed in the attached txt file. In addition, until now only in this mission, i encountered with crashes unexpectedly twice, when a popup appeared and informed me, that the game cannot continue properly this way, etc., stc.. I also attached the crashlog. Even though, until this point, i played the game on a Virtualbox XP Pro SP3 machine - with 1,25 GB of RAM and the maximal 128 MB VRAM - and after several trials, tested the game on a Windows 7 Ultimate 32bit VM too (with 1,25 GB RAM and 256 MB VRAM). At last, now i'm running it on an old physical machine (CPU: P4 3.4 GHZ, 3 GB RAM, Geforce 7950 GT VGA) and after hours, i'm still waiting for the game to be loaded. I already tried every imaginable variations of config values (in sun.ini, ddraw.ini, aqrit.cfg), then even updated ddraw to the latest version (1.1.4.15). It's also pretty weird, that even on the real PC, ddraw wouldn't use openGL rendering, only GDI, even though, the configuration is auto (attached a screenshot). One more thing worth to note, game starts to lag and slow down a bit sometimes, while i'm about after 65% of this mission. I thought, it's because of GDI rendering and the number of map objects and units, but earlier, there was already missions, with similar sized maps and number of units and everything worked fine then. All in all, i can't finish this mission and proceed to the next one, so i really need help. Thanks in advance.